This book review originally appeared in Quest: The History of Spaceflight Quarterly, 25:1 (2018). Until Canadian astronaut Chris Hadfield lit up social media during his time as Commander of the International Space Station in 2013, many people and even some Canadians did not know there was such a thing as a Canadian space program. In reality, Canada’s space activities go back many years and feature many colorful and sometimes controversial events, including leadership in establishing communications satellite technologies and the most serious attempt so far to use cannons as a means of launching satellites. Andrew Godefroy, a military analyst and historian based at the Canadian Defence Academy in Kingston, Ontario, established himself as the leading historian of Canada’s space program with his 2011 book, Defence & Discovery: Canada's Military Space Program, 1945-1974 (UBC Press), which outlined the military roots of Canada’s space activities. Now Godefroy has written the most comprehensive history of Canada’s space program, going back as far as the early studies and agencies that began during World War I and expanded in the years that followed. Following World War II, Canadian physicists associated with the Department of National Defence worked to better understand the ionosphere and its impact on radio communications in Canada’s north. This scientific work led to Canada’s first satellite, Alouette, which NASA launched in 1962 to add to our knowledge of the ionosphere, and it was followed by a second Alouette satellite and two satellites in the International Satellites for Ionospheric Studies (ISIS) program. Other defense programs led to the creation of the Black Brant sounding rocket, which was later successfully commercialized, and to the short-lived attempt to turn a cannon into a space launcher. In the 1960s, the Canadian government’s main interest in space turned to communications satellites, and while Canadian space efforts were fragmented under different departments and agencies, John H. Chapman, a physicist with a background in defense work, assumed leadership of Canada’s evolving space program. Godefroy’s treatment of these early years of Canadian space exploration is the centrepiece of the book. While the Canadian government turned the development of Canada’s communication satellite infrastructure over to Telesat Canada and the private sector in the 1970s, Godefroy’s account of this time emphasizes the Canadian government’s actions that led to Canada’s participation in the U.S. Space Shuttle Program. Starting with the development of the Space Shuttle Remote Manipulator System or Canadarm. The Canadian Space Program then chronicles the events that led to the creation of the Canadian Astronaut Program in 1983, and then the long awaited establishment of the Canadian Space Agency in 1989. Starting with Marc Garneau in 1984, eight Canadian astronauts flew into space during the life of the Space Shuttle program, six of them more than once. Godefroy’s book covers these flights through Julie Payette’s second shuttle flight to the International Space Station in 2009, which coincided with Robert Thirsk’s first Canadian long duration mission on the ISS. Canada earned its way into the ISS with its contribution of the Mobile Servicing System, an advanced version of the Canadarm. 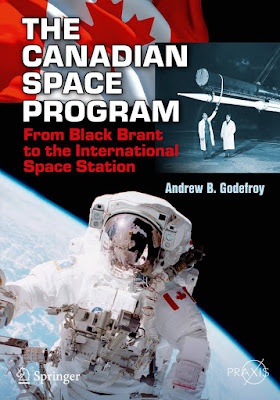 This book explains how Canadian government policy directed and sometimes hindered Canada’s many space accomplishments, many of which depended on cooperation with the United States and other spacefaring nations. Godefroy acknowledges that “there is much to be learned about the history of Canada’s space program,” and he calls this book a first step that he hopes will be followed by others on this topic. As someone who follows Canadian space history, I hope that some of those books will come from Godefroy himself.